Immediately after the rousing success and huge weekend opening of Iron Man, Marvel Comics' first fully self-financed movie, the comic book giant announced the release date for its sequel (30 April 2010), as well as a few other titles including Thor (4 June 2010), The Avengers (July 2011) and most interesting of all, Captain America (6 May 2011). 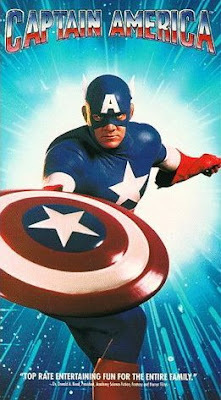 When I was barely out of my tod years, I was already a Captain America fan. I was too young then to understand the nationalistic inclinations of the character, but I was very much mesmerised by the superhero's cool, colourful costume and indestructible throwing shield. There was also something cool about him battling the Nazis during World War 2, who were led by a memorable villain called The Red Skull (who literally had a red skeleton for a head like Skeletor). Thus, an update to the concept seems inevitable. What would they need to change then? Make the character black, as one movie journalist had suggested? Update the costume to a trendier, darker colour like they did in X-men? Or maybe even change his name entirely? The First Avenger, anyone? How about giving him an Uncle Ben-like backstory to brood and sulk about and plot a revenge with? I say a resounding "no" to all of these. You take away the stuff that makes this character unique - his name, his costume and what he stands for - and make him modern, darker and edgier, you might as well call the movie Blade 4. There is only one era where the Cap would not look entirely out of place, and it's in the early 1940s, on European soil, battling Nazi supermen. Think Sky Captain and the World of Tomorrow, or Indiana Jones or the opening sequence of Hellboy. If there's one thing the silver screen lacks today, it's superhero movies set in World War Two. Of course, in The Avengers movie, Captain America would have to be transported into modern times to head a team of superheroes consisting of him, Iron Man, Thor and others (via WWII-era cryogenics technology; a la Demolition Man). I wouldn't know how the character's going to work then, but that's for the writers to fret about in these coming weeks. This week's highlight: Speed Racer!